The Texas Rangers fired manager Jeff Banister not long ago, kicking off what could be a busy offseason in terms of managerial changes. At least a handful of other teams are rumored to be contemplating changes, with decisions expected over the next week or two. 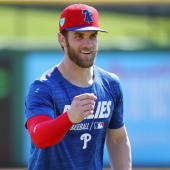 Below, you'll find all of the changes and rumors that mark the changeover from the 2018 to 2019 Major League Baseball season. Check in here throughout the winter to keep up on the latest managerial switches and rumors. Brian Snitker Safe Snitker told Kevin McAlpin of Braves Radio Network that he expects to meet with general manager Alex Anthopoulos later this week in regards to his future. The 2018 season ended for the Atlanta Braves after losing to the Dodgers 3-1 in the NLDS, but the future is bright for Snitker and his group of youngsters. Kevin Cash Extended After leading the Tampa Bay Rays to a 90-win season, Cash and the Rays finalized a deal on a multiyear extension through 2024. Buck Showalter Out Showalter is reportedly not returning as Baltimore Orioles manager next season following one of the worst seasons in franchise history, suffering a record 115 losses. Joe Maddon Safe After Chicago's early exit from the 2018 playoffs in the NL Wild Card Game, the Cubs might be forced to reevaluate Joe Maddon's future with the club. His 5-year, $28 million contract expires in 2019. David Bell In The Reds hired Bell from the Giants front office. They had previously decided against installing interim skipper Jim Riggleman on a permanent basis. Ned Yost Safe Jon Morosi reports that Yost and the Royals have agreed to a one-year contract extension that will keep him in K.C. for the 2019 season. It will be his 10th season with the Royals. Mike Scioscia Out Scioscia, MLB's longest-tenured manager, announced he will not return to the team following his 19th season at the helm. Rocco Baldelli In The Twins named Baldelli manager On Oct. 25. At 37, Baldelli is the youngest manager in the Majors.The Twins fired Paul Molitor on Oct. 2 after four seasons at helm. Don Mattingly Safe Marlins CEO and part-owner Derek Jeter told reporters that Mattingly will be back to manager the team in 2019. Jeter on the vote of confidence: " He's under contract, right? " Mickey Callaway Safe Assistant GM John Ricco told reporters he would "fully anticipate" Callaway returning in 2019. The 2018 season is Callaway's first as a big-league manager. Mike Shildt Extended Shildt, who took over on an interim basis when Mike Matheny was fired, earned a multiyear extension by guiding the Cardinals back into contention. Jeff Banister Out Banister was dismissed with a year remaining on his contract despite overseeing two division titles in his three full seasons on the job. Here are 10 options Texas could consider for the managerial opening. Charlie Montoyo In The Blue Jays will reportedly hire Rays bench coach Charlie Montoyo as their new skipper. .